Even though they have a profound effect on the universe, dark matter and dark energy remain poorly understood phenomena. 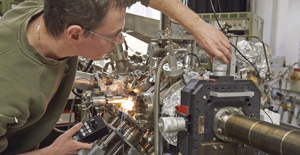 With the Munich Institute for Astro and Particle Physics (MIAPP), the Excellence Cluster Universe of the Technische Universitaet Muenchen (TUM) is opening a unique visiting research center dedicated to these and other current topics in nuclear and particle physics, astrophysics and cosmology. 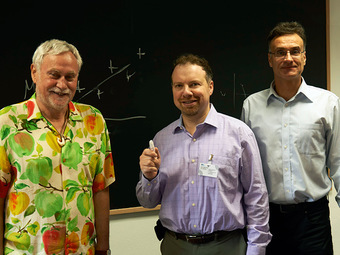 The Munich Institute for Astro and Particle Physics (MIAPP) organizes four-week research meetings on current topics in nuclear and particle physics, astrophysics and cosmology. In the context of these “programs”, as the meetings are called, up to 60 scientists will be invited to work at the visiting research center to exchange ideas, develop creative concepts and projects and enter into new collaborations. Well-known scientists from around the world will meet researchers from the physics departments of both Munich universities, Technische Universitaet Muenchen and Ludwig-Maximilians Universitaet Muenchen, the Max Planck Institutes of Physics, Astrophysics, Extraterrestrial Physics and Plasma Physics, the Leibnitz Computing Center (LRZ) and the European Southern Observatory (ESO). 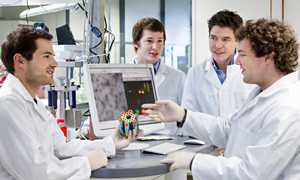 The MIAPP is located on the Research Campus Garching near Munich. 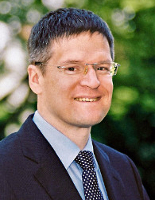 The first invitation of the MIAPP has been accepted by 53 international top researchers, including the 2011 Nobel laureates for Physics, Professor Adam G. Riess and Professor Brian P. Schmidt. In the “Extragalactic distance scale” program they hope to develop a strategy for reducing the inaccuracy of the Hubble constant from ten to one percent within the next decade. The Hubble constant is a measure for the age and expansion speed of the universe. Physicists are keen on getting an accurate value for the constant because this will open the door to new insight on dark energy – the source of the accelerated expansion of the universe. Three further four-week programs on topics of modern basic research in the fields of nuclear and particle physics, astrophysics and cosmology will follow later this year. So far some 250 scientists have registered for the programs. Just under half of all registrants are university professors or renowned researchers at research institutes. Registration is already underway for six programs slated for 2015.